According to the organizers, the 7th China (Sanya) International Orchid Show has seen sales worth 88.95 million yuan over 10 contracted deals. Besides, 22 intended deals totaling 95.6 million yuan have also been inked, while 3 agreements with investors pledging a total of 160 million yuan were signed at the show. Moreover, 8 domestic enterprises signed contracts on the spot for projects concerning orchid seedlings, cut-orchids and potted orchids on Jan 10. 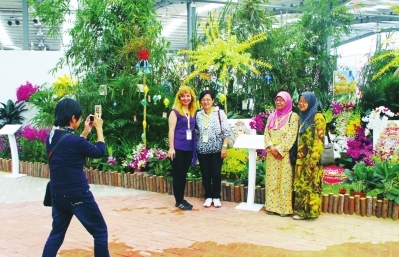 The main venue hosting the Orchid Show is the Orchid World Cultural Tourism Zone in Tianya Town. Covering 8 hectares, the area is the world’s largest orchid theme park, and a temporary special bus route between there and the downtown area has been opened to the public. Tourists can take the bus to enjoy the orchid show between 8:00am to 5:00pm from Jan.10 to 16 and the ticket price is 30 yuan for each person.